Unlike our competitors, our washer features a BUILT-IN drain pump which effortlessly automatically drains water from the washer. Clear Lid allows you to see the wash and dry cycle and monitor the water condition. Costway Portable Mini Compact Twin Tub 17.6lb Washing Machine Washer Spin Dryer Rated spinner dryer capacity: 6.6 lbs (Half of the washing capacity, you may spin twice). It features one tub for washing and a second tub for spinning. 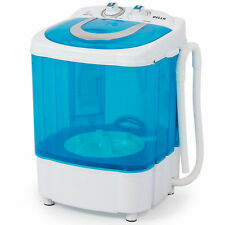 Della Small Portable Mini Compact Twin Tub Washing Machine. Washer Spin Dryer. Easily select wash or dry spin and the machine will automatically stop when the load is done. Save water and electricity by only washing what is needed. 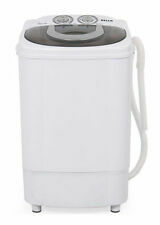 Della Small Compact Portable Mini Washing Machine. Twin Tub Washer w Spin Dryer. 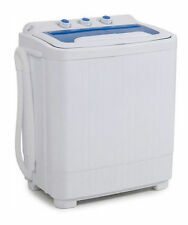 Spin Tub Material 1 x 5Kg Electric Compact Washing Machine. Spin Capacity: 3.3LB (1.5KG). Easily select wash or dry spin and the machine will automatically stop when the load is done. Features: The Washer 33L Combo 16L Dryer Compact compact washing machine and spin cycle unit is constructed of a durable plastic body. This quiet but powerful unit has a 1300RPM motor with a max frequency of 60Hz. 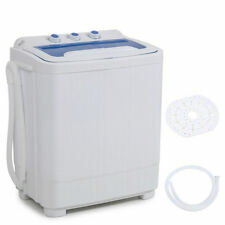 Smooth and quiet with no vibration this mini twin tub washer is the perfect choice for anyone. Easily select wash or dry spin and the machine will automatically stop when the load is done. Our machine features a drainage tube which allows you to easily drain out dirty water. Save water and electricity by only washing what is needed. Load Type Top Load. Washer Size Compact. Power Source Electric. Product Key Features. MPN 048-GM-48358. Color White. 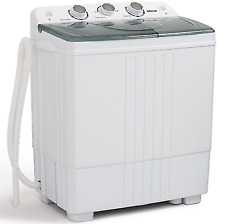 Wash Capacity: 11lb (5.0KG). Easily select wash or dry spin and the machine will automatically stop when the load is done. Our machine features a drainage tube which allows you to easily drain out dirty water. Custom Bundle No. Use Portable Washing Machine. Washer Size Portable. Compatible Appliance Washing Machine/Dryer. Part - Category Main Washing Machine. 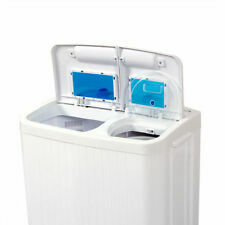 Null Della Twin Tub 048-GM-48036 White Washing Machine. Easily select wash or dry spin and the machine will automatically stop when the load is done. Reversible Door: No. Overall Width - Side to Side: 24". Frecuencia de tensión: 110 V / 60 Hz. Nuevo y de alta calidad. Eco-amigable ahorro de energía. Fácil de usar. Nuestra lavadora compacta portátil es la solución perfecta para lavar la ropa en un entorno compacto. Ahorre agua y electricidad solo lavando lo que se necesita. Poder de la lavadora: 260W. Lavadora compacta eléctrica de 1 x 5Kg.